A quick search on Google for ‘Social Marketing’ returns 859 MILLION (859,000,000) results because every unemployed, fired or lazy person who calls themselves a ‘Social Media Marketing Expert’ has a social networking page. Social Marketing CANNOT be done by an unemployed person working from home, by a college intern or by anyone at the office. 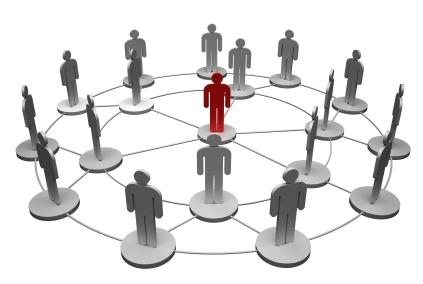 The entire basis of ‘Social Networking’ is multiple connections over multiple interfaces by multiple people – it cannot and will not work with 1 or 2 people ‘posting’ about your company, product or service online. When we first started marketing using Social Networks in 2008 we recognized the value in using social networks as a method of expanding reach online. Years later there are hundreds of millions of people attempting to use ‘Social Marketing’ as a job title although there is no such job. Social Marketing is simply a part of an overall Online Marketing strategy and only works as part of that strategy. If a company hires someone to do ‘social marketing’ but does not have an effective website, a wide spread national network to interact, promote and create the ‘buzz’ required. The way search engines interpret social networking data, posts, pages and profiles is the key. A Facebook business page or profile that has posts and only a small amount of interaction has no value at all. This means no search engine lists the information and nobody on the social network saw it except you and the person who posted it. There are literally hundreds of thousands of companies being ripped off every day by dishonest incompetent people claiming to ‘Do Social Marketing’. A great example of this is a local company (we blocked out the name to protect the company) who hired an unemployed x-convict who has a Social Butterfly Marketing Facebook Page and Blog claiming to ‘Do Social Marketing’. She created a Google+ page and a Facebook page and posts photos of the business owner every few days and even a logo or an address once or twice. This has ZERO benefit for the company, there has not been a single interaction, never and thus nobody saw any of this except the lady posting it from home. Another thing to watch out for with the ‘work from home’ social marketing is that they have nothing to lose, no business to take to court, no reputation at risk and no standards of conduct. If you hire one of the ‘work from home’ unemployed ‘social marketers’ and then choose to terminate services they may choose to steal all of your accounts, spread lies and false information about your business and use what little skill they have to harass you. No legitimate company or professional would ever do such a thing so do your research and look at EVERYTHING the people have posted and make sure they have a solid business reputation with an office, staff and other professionals to support you. Social Networking has been around for years, it transformed from a place to catch up with old friends from college or find a new band to the top online marketing platform in less than 5 years. There are several recent studies that cover a wide range of statistical data, use and success from all of the social networks. Facebook is still King: As of April 2013 Facebook has had over 120 BILLION Impressions where the longer posts were less read and less interacted with than shorter ones in the 100-119 character range. Posts with Questions drove interaction up 10-20% as the chart below illustrates (on the left you see the character length and the red is posts with Questions while blue is posts Without Questions). 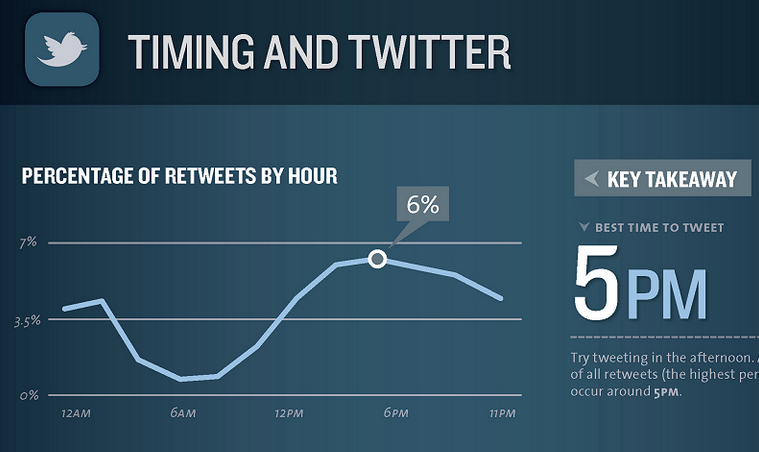 Timing is Everything – the KISSMetrics study found that the best time to post on Twitter for ReTweets is 5PM. The best time to post on Facebook for the most Shares is 1PM. The best number of times to Tweet on Twitter is 1-2 Tweets per hour while it is best to post an average of once every two days on Facebook. A third study by Argyle Social found the best time to post on both Facebook and Twitter is 9AM-7PM. 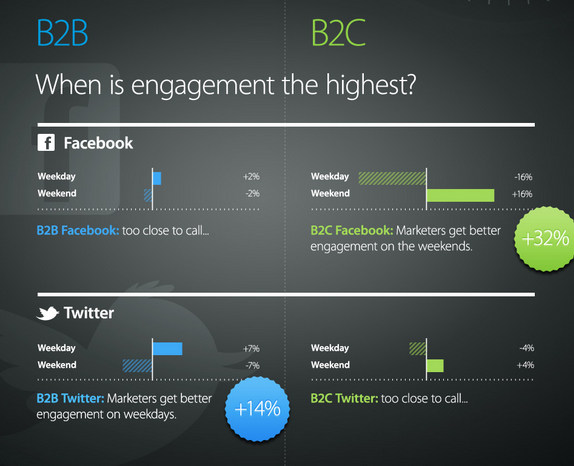 Tweets during the Weekday have 14% more interaction than on Weekends. The last item is the most unusual since the study found posts on Facebook have 32% more interaction on Weekends than Weekdays. 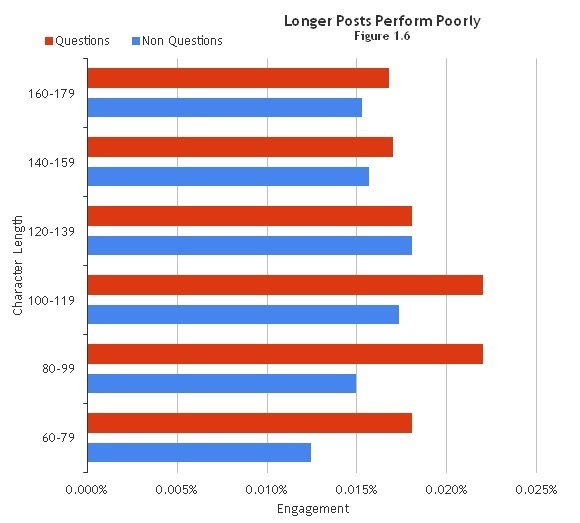 Most other studies conflict with this finding the best times to post on Facebook are during the week. This is # 1 reason Facebook GraphSearch engine is going to change the way companies market online. People like to work with, go where, be with and buy from others that they know and trust. Facebook has more information about people than any other site on the Internet thus when someone searches for a “Pizza Place’ or ‘Real Estate Agent’ and Facebook shows them a list of pizza places friends like or real estate agents friends work with they are highly likely to use what friends did. The average ‘Shelf Life’ of Social Networking Links or Posts is only 3 Hours. A study by Bit.ly tracked user posts on Facebook, Twitter, YouTube and direct on Bit.ly showing the most interaction happens within the first 60 minutes of a post. 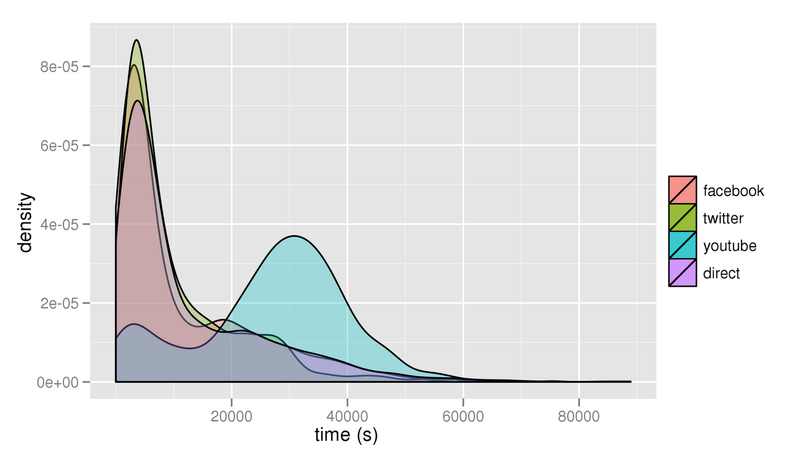 The chart below shows the density or views/interactions on the left with the time/seconds across the bottom. 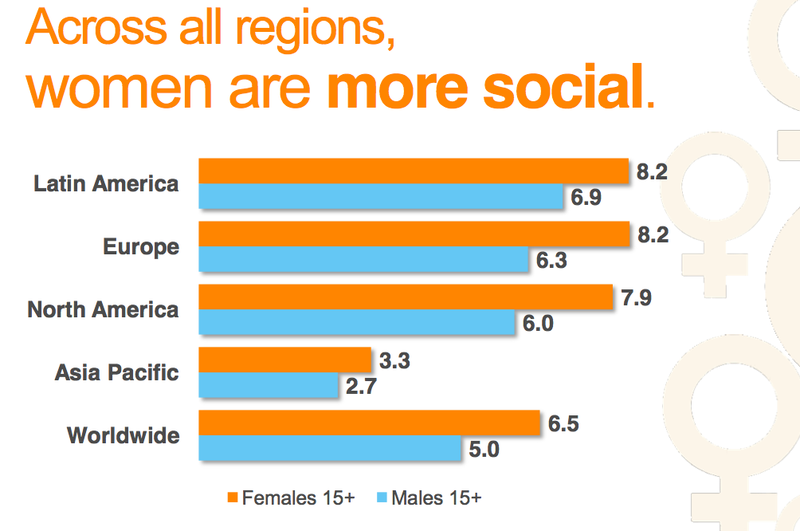 Women Spend 30% more time on Social Networking websites than men. This study by ComScore is fairly well known although I would say I am the exception to the rule since I am on Social Networks 12+ hours a day! Some social networking sites like Pinterest have a significantly higher rate of use by women over men while others like Twitter are closer to equal. Statistically Social Networks are THE place to market no matter what age, gender, race or location you are targeting. Social networks constitute over 20% of the total online time worldwide with more daily users on Facebook alone than ALL search engines combined. The key is knowing how to setup, optimize, manage and obtain the most interaction. If you would like an expert consultation on social networking, social media marketing, search engine optimization or simply have a question Contact the Internet Experts at Internet Builder Consulting online or Call us at 816-842-7774. The online marketing world changed when Facebook became the #1 destination on the Internet. Somehow most of the marketing firms, ad agencies and website designers missed the boat. Social Marketing is not a new ‘separate’ thing for companies to do, it is one of the main requirements for Search Engine Optimization (SEO) success. Everyone optimizes for Google since Google has 67% of the entire search engine traffic but Facebook has 300 times more traffic than Google. In 2010 Facebook partnered with Microsoft to integrate Bing as the search provider for users. 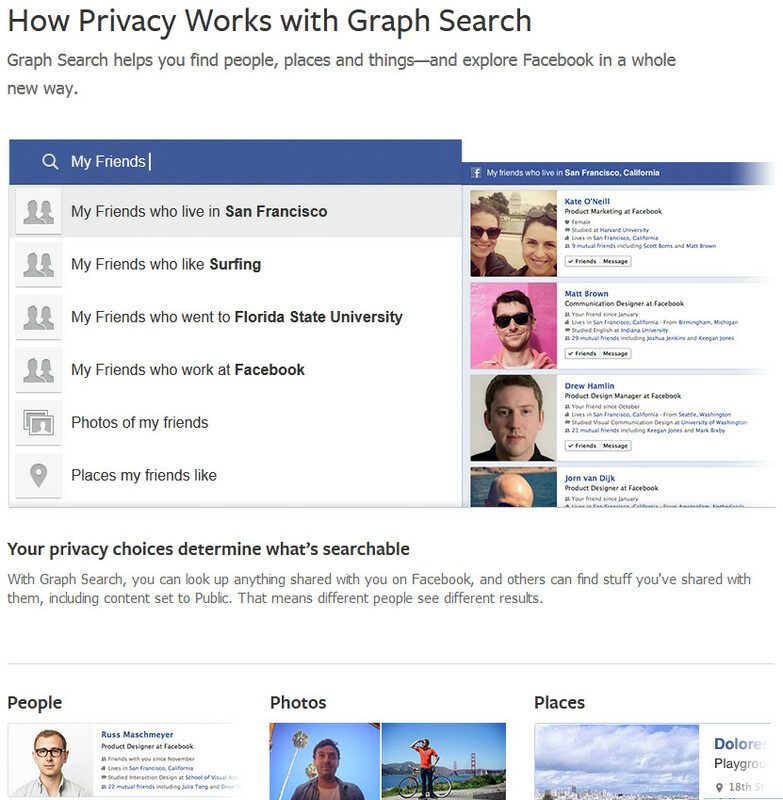 In 2013 Facebook turned itself into a search engine with the release of Facebook GraphSearch with additional content provided by Microsoft Bing. Since Facebook has over a BILLION active users as of December 2012 the best place to reach someone online is now Facebook. Google is competing with Facebook for traffic and users but still uses Facebook posts, interactions and content as the #1 ranking criteria when determining how high to list a website on the Google Search Engine. 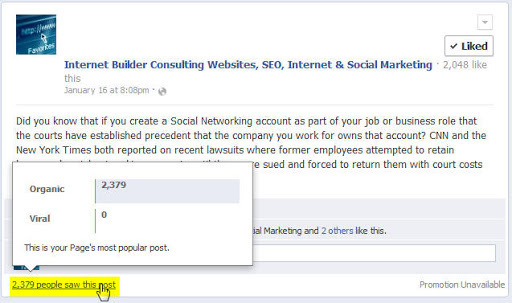 Based upon how the company Facebook page and content were setup and optimized they show up #1 above all the competition. 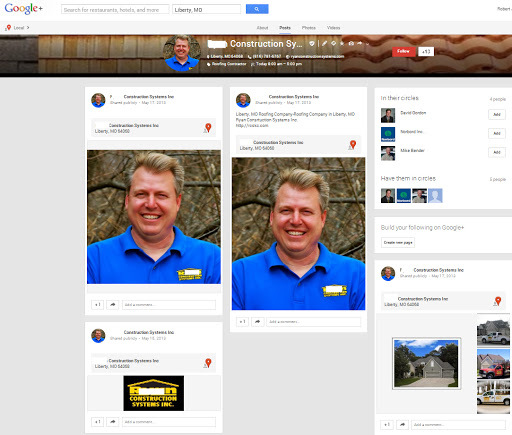 A Google+ profile and company page improves ranking on Google when setup and optimized properly. Companies who are missing the key element of Search Engine Optimized Social Networking are missing out on more than 50% of potential reach online. SEO and Social Marketing cannot be separated they must be managed and maintained as part of an overall cohesive online marketing strategy to be successful. The Facebook GraphSearch first searches Facebook for content related to what you type then displays content from Bing search engine. The example below illustrates how a search for ‘Kansas City Pizza’ first shows the top result 11 of my immediate connections ‘Like’ followed by the most popular result, Grinders Pizza and then suggestions for additional terms based on location (Kansas City, Missouri or Kansas City, Kansas). Adding a location to a search on Facebook is the same as adding a location to a search on any search engine. People who just search for ‘Pizza’ may end up with results for pizza places all over the world while people who specify a location will end up with better results. 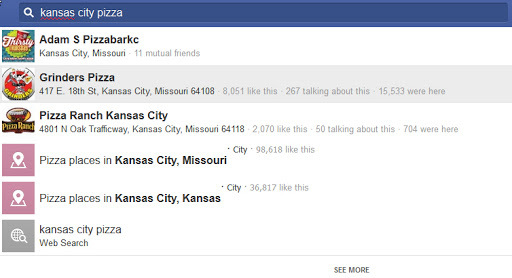 With the results above for ‘Kansas City pizza’ I could easily optimize any of the local pizza joints Facebook page to place them in the top few search results. The Social Marketing Optimization works for any business and dramatically improves rankings on search engines. A search for ‘Websites, Search Engine Optimization’ on Facebook GraphSearch brings up our company website first along with several suggestions related to this based on the traffic, interaction and how well the page has been optimized. The key successfully integrating SMO and SEO is understanding how both social networks and search engines organize, rank and display data. Today the majority of links created TO websites are coming from Social Networks thus a website that is properly search engine optimized integrating social networking with social marketing optimized can easily have thousands upon thousands of active, high value links. The example below shows how one of our company websites is ranked by Google at 162,656 active links! A website is not complete without being optimized for search engines and social networks. Search Engine Optimization is, in part, how a website is built and what content is placed within the website but the largest factor today on how well a website ranks is social networking. A successful website will incorporate SEO, Social Marketing with Social Marketing Optimization (SMO) and a strong ongoing online marketing campaign. Social Networking IS part of SEO and must be handled by the same experts who build the website, optimize the website and market the website for the best results. Ongoing adjustments with the website and online marketing need to be made as social networks change, release new features and search engines adjust ranking algorithms. Make sure the website firm you hire has a COMPLETE understanding of the Internet, SEO and Social Networks or you may end up wasting time and money on an incomplete solution. Over the past few months since Facebook released the ‘Promote’ option for posts we have been studying it. The option is a one-click ‘Promote’ this link listed on each post for a simple $7 fee to ‘expand’ the post into a wider audience. In terms of marketing this seems like a no-brainer since anyone can post an ad, article, news or information and reach more people without having to setup a pay per click account. Initially the fee was $5 but once it proved to be a success the fee was raised to $7. When anyone makes an update on a ‘Page’ or ‘Profile’ the option will show on the lower right side to ‘Promote’ this post with an estimated reach listed. 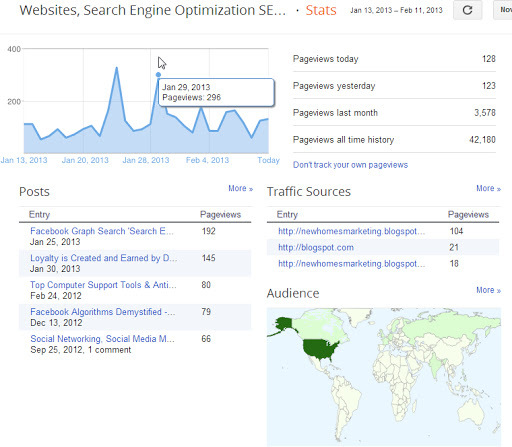 We used this option to ‘Promote’ several posts from August 2012 to February 2013 and tracked the results. Using Google Analytics, each post was tracked by the number of views and referrers it received naturally versus the ‘Promote’ option. We expected the ‘Promote’ option to deliver a significantly higher return but were surprised when it was nearly the same as a regular post nearly every single time. The ‘Promote’ option was used on the example below showed 331 views on the first ‘Promoted’ post while the second post had 296 views without any paid promotion. There was a significant spike in views every time a post was shared on Facebook but the difference between a paid post and a normal one was usually around 10%. The next thing we tried was posting the same link and information on other social networks such as Twitter, LinkedIn and Google+. The Twitter post has no noticeable difference in traffic over a normal day similar to a post made on Google+. The LinkedIn post, without promotion had a significant spike in traffic as you can see in the chart below showing the 3 times a post was made on LinkedIn. The increase in visits from LinkedIn were significant but only 10% of the total traffic delivered from Facebook on either a paid or normal post. The idea of paid promotion or ‘Pay Per Click’ on Facebook may seem like an easy way to reach a wider audience but the results show it has no real value…yet. In an earlier article I wrote about Facebook Pay Per Click (PPC) options we tested last year. The PPC marketing on Facebook produced zero results over a 12 month study using multiple accounts. If a company is looking for ‘Branding’ alone then Facebook PPC ads are a viable option but there are too many problems with the tracking, click fraud and service to be effective for most users today. If your company needs a BETTER Website, SEO or Social Marketing be sure to contact the experts at Internet Builder Consulting and let us know how we can help! 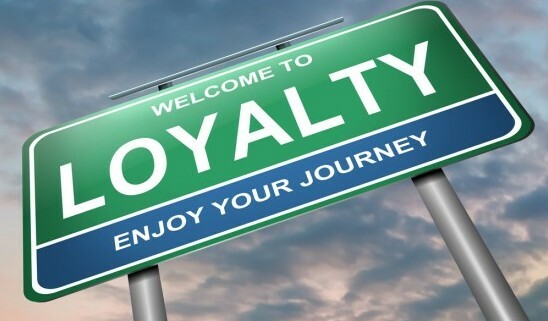 With a challenging economy, high unemployment and an unclear future the value of loyalty has never been higher. Today most companies have lost sight on the things that should be the MOST important such as service, support, solutions, respect, results and loyalty. When the economy tanked dozens of the builders and real estate customers we work with went from having large marketing budgets to barely being able to pay the bills. The first few calls came in 2007 where someone asked to ‘take down the website’ because they could not afford to pay for the hosting or marketing. Many companies would simply go ahead and disconnect service but we choose to take a different route. I personally contacted everyone who called to let them know we appreciate their business, support and loyalty so we were going to return that loyalty and support by paying the bills for the customer until things were better. The first few times I did this the lady who handles our accounting nearly had a heart attack. Not only was I telling her to stop trying to collect money I was explaining that WE were now paying the bills for the customers. Many of these companies and people were the same ones who helped our small website company get started from my house in 1995 buying websites from ‘that Dotcom guy’ when business was good and few companies felt they really needed a website to sell a home. As the market and technology changed websites and online marketing became invaluable and when times are tough a website may be the only hope a builder has to reach a buyer…so we keep the websites on. The decision to do what is right instead of what is most profitable has made cash flow tight from time to time but given the choice to make more or help more we will always choose to help. Google’s motto is “Don’t Be Evil” while Internet Builder Consulting’s motto is “Do What is Right and Make it Better Because We are Here”. There are literally thousands of people and companies who offer websites, SEO and online marketing today. What has made Internet Builder Consulting successful, the Best Place to Work in Kansas City with 91% customer retention are a few key things. Go above and beyond to take care of the customer, help find a resolution no matter who is at fault, no matter what time or what day it is. Under promise and over deliver whenever possible, communicate and make sure the customer and staff knows how much you appreciate them. Things happen, staff changes from time to time and mistakes or delays are inevitable no matter how good you are or how well run things may be. When something goes wrong address it, learn from it and make sure the customer knows it will be resolved. We use social networks to share updates for the company, planned system updates or upgrades and to educate on new technologies since education is ALWAYS better than sales. Never ever sell something if you do not have that expertise in-house with complete control of the quality, capabilities and results. Never misrepresent yourself as something you are not, it may help increase sales in the short term but eventually people find out. Have everyone in the company join social networks and interact with customers, post updates and ideas on projects and get to know the people we work with. Customers are on Facebook or Twitter where they may read updates, company news or events and contact you if they need something. If you really care about the companies and people you work with then get involved with them and learn more about who they are, what they enjoy and causes they support. Internet Builder Consulting has donated dozens of websites to charities, organizations and worthy causes for customers. 4. Walk the Walk, if you Sell It you should Do It (better than anyone else)! If you sell websites and website hosting then you better have a crack team of website designers, developers, SEO and Social Marketing experts ON STAFF and have all of that setup properly for your company. Too often someone sells a service they don’t use or really understand, such as Social Marketing or SEO, simply because it is a ‘hot item’ customers ask for. Internet Builder Consulting started writing articles, teaching website, online marketing and SEO classes in 1999 and Social Marketing classes in 2007 and all services are practiced every day at the office. It takes a team of dedicated experts to keep ahead of the technology curve. 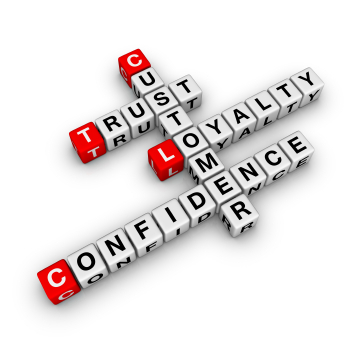 No matter what, be loyal to the customers, companies and people you work with. These are the people and businesses that helped you succeed so when they need help make sure you are there. This extends past the office, we have customers who support Down Syndrome diabetes, breast cancer and local charities which we volunteer for and donate websites, marketing, photography or whatever is needed. Doing what is right is usually not what is easy or most profitable but it is the way we do business and live life. It’s not about the money, it is about doing what you love with people you want to be around and companies you respect and support. Google has dominated the search engines for over 10 years now leaving Yahoo, Bing, AskJeeves, AOL and everyone else far behind. Internet Builder Consulting has been saying it since 2009 when Facebook began showing ‘search results’ outside of Facebook using Microsoft Bing that it was only a matter of time before Facebook became it’s own ‘Search Engine’. The time has come and past and now the Billions of Facebook Users will never have to leave Facebook to search on Google, Yahoo or Bing again. The first version of Facebook Graph Search works on the most valuable aspect of Facebook, your friends, what they are doing, where they have been and what they like. People use Facebook because it instantly connects them with like minded individuals, people ‘like ME’ which is common in society. Facebook Graph Search provides levels of detail no other search engine can provide enabling you to search for ‘friends’ who like Pizza or have visited Spain or even locate someone you may have met at a store that helped you and you wanted to thank. Interesting enough this works quite well since the latest professional to join the Internet Builder Consulting team, Jennifer was found through Facebook after some exceptional service at the pharmacy. I used Facebook to narrow down a list of people names Jennifer that worked at a pharmacy in Kansas City and ended friends with our latest hard working team member! The first version of Facebook Graph Search is focused on primarily searching ‘friends’ and connections As the system progresses it will include Business Pages and Fan Pages eventually encompassing all aspects and INFORMATION stored on Facebook. The image below is the new Facebook Graph Search menu with a few ‘suggested’ search options although you can search for ANYTHING! 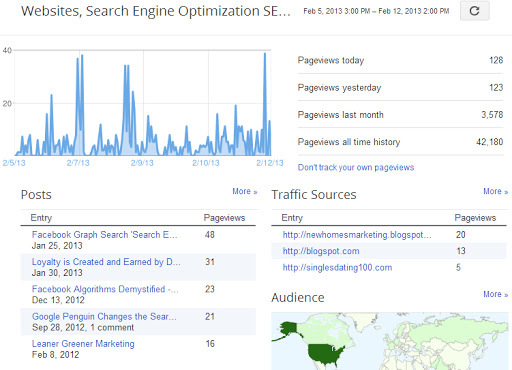 Google has its first real challenger here while Microsoft is going to see a boost in traffic on Bing. When Graph Search doesn’t find the results you are looking for, you will also get a list of Bing web results within Facebook. This also dramatically increases the value in Social Marketing Optimization (SMO) as part of any effective Search Engine Optimization (SEO) program. It is NOT about the ‘likes’ a Facebook page has, it is about how it is setup, optimized and connected just like SEO is for a website. Mark Zuckerberg said the main difference is Graph Search’s ability to deliver ‘answers’ rather than ‘links to answers’ makes it clear that Facebook and Bing are on the same page: The Bing team has long been working on a search solution that eschews “blue links” in favor of a search engine where people are as important as pages. Bing Director Stefan Weitz recently stated that the majority of people doing research on the internet, for a new product, or a potential vacation, won’t rely on search engine page alone. They will turn to friends and experts to get additional input before making a decision. The more Bing enhances its social sidebar with increasing amounts of social data, the less you are likely to jump around to other sources. If you would like to know more about how to setup, optimize, market and manage your business, products or services online contact The Experts at Internet Builder Consulting for a consultation 816-842-7774 – we helped create social marketing with 18 years experience building BETTER Websites, SEO and Social Marketing solutions. Having a Facebook page with effective, optimized social marketing, has never been more important for the success of your business. It’s not about the likes, it’s about the leads. This shows the top ‘friends’ (or stalkers) that Facebook considers to have the most ‘connections’ which can mean a wide variety of things including who is looking at your profile, updates and photos the most! There are additional items Facebook take into account into generating your profile and who or what they show when you login to Facebook. The OrderedFriendsList places the most emphasis on recent interactions you have with a person. Another major factor is the searches you do, so it actually details more about your online Facebook habits than it does about the people who may be ‘stalking’ you. 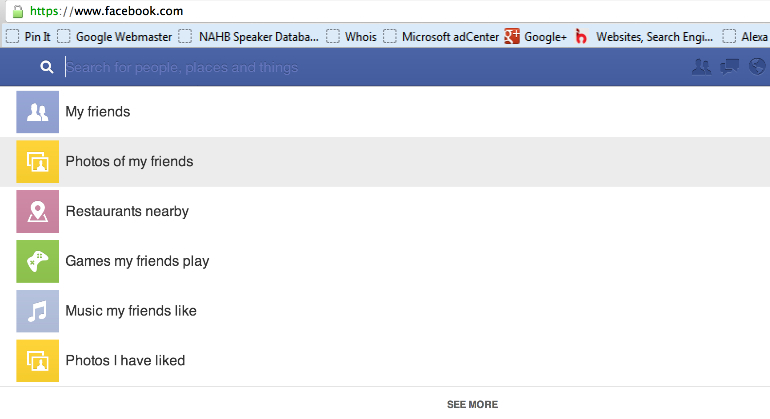 Another key indicator Facebook uses the above information for is advertising. Ads and marketing are targeted to you based upon what YOU post, share and comment on Facebook. An example is when I posted about wanting to go see the new James Bond movie the very next advertisement Facebook showed was for a local theater playing the James Bond movie. The next day my email address associated with the Facebook account received two emails from theaters marketing the James Bond movie. Another example, shown below, highlights a simple update on my profile about playing ‘pool’ with a friend and going to CVS Pharmacy. The instant this update was posted, advertisements and content identically matching those words was displayed by Facebook! The display ads on the side of Facebook are also manipulated based upon the same criteria above. The secondary determination is the advertisers in the local area or that have your specific details set as part of the Facebook Ad Campaign. The latest Facebook advertising permits marketers to specify details such as the company someone works for, a group they belong to, age range, levels of education, geographic locations and even specific hobbies or interests Facebook users have listed on their profiles. The targeting methodology is exceptional although the results do not match since there is a significant amount of ‘Click Fraud’ taking place on Facebook. We setup some test accounts paying $2.86-$6.93 PER CLICK and then tracked the traffic coming to the website from Facebook ads. The shocking result was that ALL of the clicks came from two specific locations within 5 minutes of the ads going live until the daily spending budget was reached every single day. From the perspective of an Ad Agency they would consider this a success because the Facebook ad delivered ‘Likes’ and ‘Clicks’ to the customer’s website. From the perspective of an Internet Expert this was a complete waste of money since the clicks and ‘Likes’ were clearly coming from one location repeatedly which was a waste of money. There are some free valuable metrics and data available for Facebook Pages showing how many people viewed each individual update, which posts reached the widest audience and options to ‘Promote’ an update, photo or status for a flat rate. If you hover over any photo, update or post on a page you are an Administer of you can see details such as the Organic (people directly connected to your page who ‘Like’ it) or Viral (people who shared the post with friends). Facebook remains the #1 destination on the Internet today with more than 1 Billion users. The potential for proper marketing, optimization, branding and sales through Facebook is unlimited when done properly. Pay Per Click ads are best focused on Google, Yahoo and Bing while an active, engaging social marketing campaign on Facebook can convert ‘Likes’ to ‘Leads’ when done properly. For expert SEO, Social Marketing, training or consulting for your business contact the Internet Experts at Internet Builder Consulting and Social Marketing Builders today for a complimentary consultation 816-842-7774. When I refer to a ‘Facebook Flirt’ it does not involve trying to pick up a date from a social network. 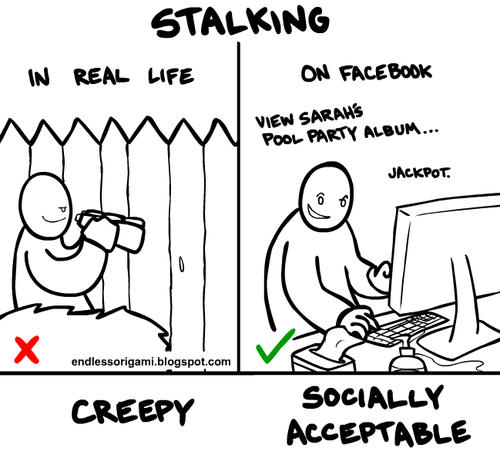 Many forget the social aspects of social networking which often leads to failure. People buy from people and they will buy more from people they know and like. There are easy to spot trends on social networks that anyone with any social skills can spot and track. Consider a new ‘Facebook Friend’ who may be a friend of a friend or associate who suddenly starts ‘Liking’ and ‘Commenting’ on everything you post. This may simply be that they never knew you existed before today but in most cases this type of interaction shows an increased interest of some kind. The art of flirting is more than trying to pickup someone, it is the method to engage and interact with someone that entices them to react and respond. When our firm began marketing on Social Networks we tested several different methods with several of our staff. One of the interesting things we discovered is that social networking interaction is nearly identical to the social interactions we may encounter out at a bar or dinner with friends. The more attractive staff instantly had more ‘friends’ online who interacted more with them. There is a line to walk in terms of ‘flirting’ and interacting which we quickly found when new ‘Facebook Friends’ began asking our social marketing staff out on dates! The art comes into play in being able to post interesting things that people actually want to read while integrating the company, brand or product. The flirting aspect comes into play through the interaction, commenting on updates and posts made by others and keeping everyone interested in what YOU have to share. If you provide the marketing for another company then you must know their product, service or brand as good or better than people who work for that company. This requires constant research, insight, interaction and discipline to constantly keep things flowing without distraction. Social Marketing Success depends upon mastering the Art of the Facebook Flirt by creating memorable interactions, unique messages and compelling posts that buyers connect with. The methods used and formatting of the company pages, individual posts and updates all contribute to the success or failure of the social media marketing campaign. Be cognizant of not crossing the line since you never know how others may interpret what you share online. When someone shows interest keep it online and professional, there is no room for mistakes that can harm your reputation and business. One of the key factors for success with Online Marketing and Social Media Marketing is timing. Companies who post when people are offline or asleep are marketing to an empty audience. A Facebook marketing post will get half of its reach in the 30 minutes after it is published, according to research by Socialbakers. The study found that an average of 1/3 of post reach was obtained in just the first 10 minutes after publication. Socialbakers indicated that after the first 1/2 of reach is obtained in the 30 minutes after the post is made with the remaining reach attained in the following 7 hours. In the 11-20 minute period after publication, posts reached an estimated additional 13.2% of their total audience, while in the following 10-minute period, they reached just another 4.7% of their total audience. After 90 minutes had passed, the average post was reaching less than 2% of its total audience. The numbers for social networking reach are significantly different than emails as a recent GetResponse study illustrates. According to a GetResponse study 23.6% of email opens occur within the first hour after delivery. 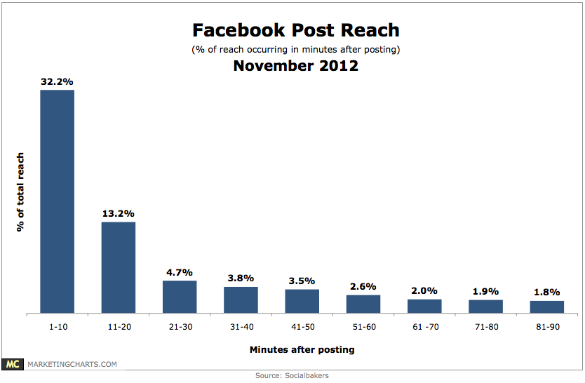 In the first hour, a Facebook post would have already reached 60% of its total audience. The importance of timing messages and posts becomes significant when considering the share of opens and reach occurring immediately after delivery. Adobe recently reported that Facebook fan engagement rates surged in the Third Quarter, they still remain quite low. According to a NapkinLabs study of brand pages with between 200,000 and 1 million fans (reported by Mashable), only 6% of Facebook fans engage with brands’ Facebook pages by liking, sharing, or commenting. That may even be high. Looking specifically at the automotive sector, Socialbakers found that the most engaging post, by Rolls-Royce, had an engagement rate of 5.74%. The 4th-most engaging post saw just a 5% engagement rate. Smaller brands and companies with a local connection typically see higher interaction rates. The typical post made by individuals have a significantly higher interaction rate since people tend to connect and interact with other people more than products or brands. This is the reason ‘social marketing’ works best when a company Facebook Page is used in conjunction with staff and individual Facebook Profiles. Contact the social marketing experts at Internet Builder Consulting for professional Social Networking setup, management and marketing today at 816-842-7774.